I have spent the last several years trying to figure out what works and what doesn’t in our homeschool. 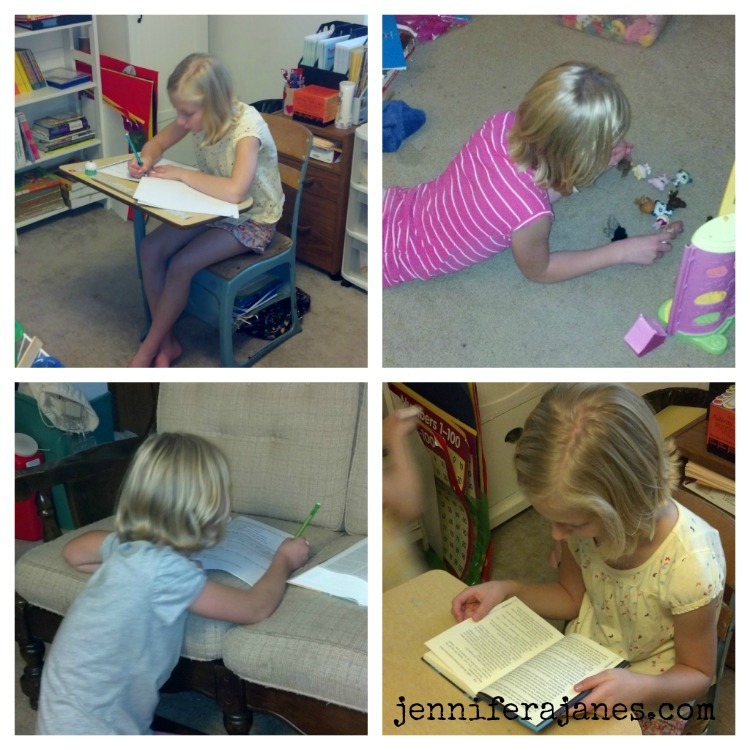 Discovering how my children learn best and more about their personalities has been a big part of our homeschooling journey. It hasn’t been easy. My older daughter learns in a more traditional way, but my younger daughter has a very different learning style (which is complicated by the fact that she has chronic health problems and neurological issues, including a diagnosis on the autism spectrum). Then I learned about Kidzmet, and it became much easier. Kidzmet provides customized learning profiles based on a very easy (and FREE) assessment that your kids take online. (There’s even a beta version of an assessment for non-readers, which worked well for my little one and was just as accurate as the assessment for readers.) While the report that you get at no cost provides a lot of great information, the Playbooks go into more detail and cover more aspects of the learning process. Note: Kidzmet doesn’t address learning difficulties and disabilities, and the beginning of the Playbook recommends that you use the techniques and strategies recommended by experts for your child’s particular learning challenges along with Kidzmet, which was developed for the average learner. The personality profiles Kidzmet provides and the suggestions for teaching are invaluable. I had figured out quite a bit about my girls already, but Kidzmet showed me why the things that work in our homeschool work so well. My younger daughter is an Extroverted Feeling Judger (EFJ). After reading her Playbook, I understood why she needs to have me close when she’s doing her lessons. Why she needs to talk while she works. Why she is so drawn to art, dance, and music. Why she “acts out” math problems with toys and manipulatives, telling herself stories as she works. All of these are part of her personality and learning style, and they help her process information in the way that’s most effective for her, which helps us work through those learning differences. My older daughter is an Introverted Sensing Judger. Now I understand why she prefers to do her school work alone, take frequent breaks to play or read for a few minutes by herself, and why she’ll move around until she finds a place to suit her mood. She needs quiet time and space to think through everything and process it as she works. She enjoys spending time with us and interacting with us, but when she’s really working, she needs solitude. Both have a need for checklists and schedules they can follow to show them the progress they’re making in their daily to-do list and long-term projects. My younger daughter needs to learn how to use different types of graphic organizers to help her think through topics in a more organized way so that she can use the information for assignments and projects. I need to give my older daughter the opportunity to “teach” me (and her younger sister) sometimes so that she can process the information. There’s more I need to work on including in our homeschool to optimize the girls’ learning experience, but you get the idea, right? 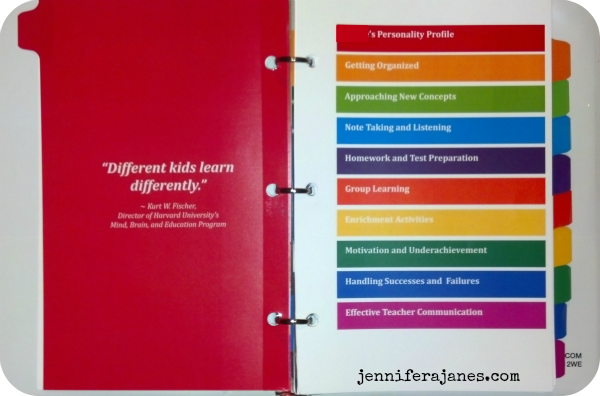 Kidzmet Playbooks are packed with information about your child’s learning style and personality type! Kidzmet provides several options with price points for every budget. The Personalized Kit will become a LIMITED EDITION, available only for special promotions, very soon. The Kidzmet website says they’re available while supplies last for $49.95. This includes the Playbook binder personalized throughout with your child’s name, the printable templates CD, and the multiple intelligences book. Playbooks are already available in various e-reader formats for just $9.99 each, and their availability will not change. Paperback Playbook of your child’s learning style for $14.99. The Paperback Playbook Kit will include the paperback Playbook of your child’s learning style, printable templates CD, and multiple intelligences activity book for $19.99. A new Teacher’s Kit will include a paperback Playbook for each of the 8 learning styles, the printables CD, the Learning Activities book, and 1 full year of a Kidzmet classroom account–where teachers can profile ALL of their students, send student snapshots to parents, use the student segmenter app, and find out how they “fit” with each of their students. All of this will cost $99.99. You can also enter to win ONE of the Limited Edition Personalized Playbooks for Learning right here! This giveaway is for U.S. residents only. You must be 18 or older to win. This giveaway is not associated with or connected to any social media site. The winner will have 48 hours to respond via email with a U.S. mailing address. Please read the full terms and conditions in the Giveaway Tools widget. Can’t Wait to Get Your Hands on Kidzmet? Disclosure: I received the Personalized Kit and a digital Playbook free in exchange for an honest review. I will receive compensation for the time spent reviewing the products, but I was not required to write a positive review. All opinions expressed are my own. I only recommend products that I have used and found beneficial for my family. This post contains affiliate links. 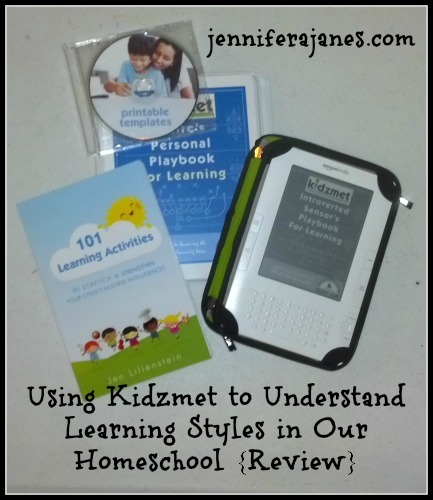 This entry was posted in Homeschool, Homeschool Curriculum Reviews, iHN, Review, Special Needs and tagged homeschool, homeschooling, iHomeschool Network, Kidzmet, learning styles, personality types, product review. Bookmark the permalink. you know why! 😉 I have a son who has some learning differences – this will be a great help! It doesn’t address the learning differences, Kelli, but it sure does help to know what the natural learning style is so you’re not fighting against it with the strategies you use to try to move past the glitches! yes, I did read that – but it will still help me help him 😉 like you said – great review- thank you for sharing. You’re welcome. And yes, I do think it will help you help him! I also have done the free quizes with my kids and it was right on!! I would love to win this!! I have two completely different kids (like so many parents do). I am constantly looking for new tools to help with my child’s learning… to make it fun, interesting and “stick”! This sounds very interesting and helpful. My kids are only 3 and 2, but I can already tell that they learn differently and are going to need special ways for instructions. This sounds like it will be a great time saver from me having to find out by trial and error. Thanks for the offer and this review! I was an ISJ also! Thanks for letting me know about this awesome service. Great to know the personality and learning type of one’s kids. I’ve found knowing my personality typed helped me alot in understanding myself. I always like to find ideas for teaching them better. I would love to have help with pinning down how my kids learn. I think I understand most of that, but sometimes a little extra light shed can make a big difference. This will be a great help with my boys. This would be awesome, we cant afford anything like this on our budget so it would be a big boost! Oh this would be amazing for my son! We took the quiz and it was right on. So many things that I didn’t know yet, but there were others that I just nodded and smiled about. Thank you for the giveaway! Wow! Two of my kiddos just took the test, I would love to see the personal playbooks! Kidzmet sounds like an incredible tool. This is my second year as a home educator, and my daughter and I struggle with student-teacher compatibility more days than not. I know that finding ways to adapt my teaching methods to her unique learning style would help. I have looked into my kids’ learning styles before, this one looks a little different, but I’m always up for finding more ways to work with them to help them learn and enjoy doing it. I think this will be a great addition to our homeschool – and I know that when your family enjoys a product, my family will enjoy it, too! I’d love to win because two of my four kiddos are so different and I want to understand them better and teach them as best I can. This would be a big help in figuring out how to tailor lessons for each of my boys. We are just beginning homeschooling with our preschooler and this would be great to get a “head start” on what would be the most effective teaching techniques. My kids all have such different learning styles this seems like it would be a great resource to help understand how best to approach each subject with them. I would like to win so I can figure out how to teach my children. I would love to win this tool to help me reach my children individually and help them learn in a way they can understand. I love Kidzmet and would love to win a playbook. Thanks for the opportunity and love your site! We are just starting out homeschooling so any tool that can help me understand the best way to teach my children would be a great help. I would love to win this so I can discover the learning styles of my 3 children. I know they are all intelligent, yet very different thinkers, and knowing the ways in which they each learn would be very beneficial to our homeschool.